The Social Network is a drama directed by Fight Club’s David Fincher based on Ben Mezrich's novel The Accidental Billionaires. 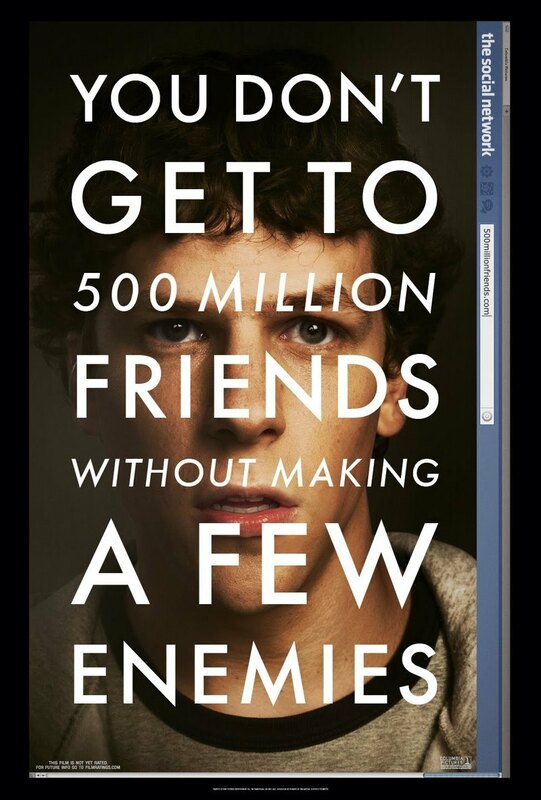 We are introduced to Mark Zuckerberg (played brilliantly by Jesse Eisenberg) a Harvard University student. After having his heart broken by his girlfriend Erica Albright (played by Fincher’s Girl with the Dragon Tattoo Rooney Mara), Mark ventures back to his dorm room to get drunk, blog about his recent experience and to also create a website with an algorithm provided by his friend Eduardo Saverin (the new Spiderman Andrew Garfield) to rate the attractiveness of female Harvard undergraduates, as you do. The website becomes so popular that the Harvard server crashes. Hollywood has a tradition of making rags to riches stories which detail the destructiveness the journey to materialistic success can have on individuals and their relationships. Perhaps this may be due to mass-audiences appreciating this type of story to reinstate a general fear of success: I’m glad I’m not a great success as bad things will happen. It is this quality of focus, determination and low status that draws people to Mark. However, in his drive to connect the world through online social networking, these same qualities, along with his distrustful nature, coldness and social awkwardness are also what drives people away. All the characters in the movie are well rounded. Nobody is simply a hero or villain. We see all parties’ points of view equally represented, and can fully empathies with them; from Mark’s girlfriend, to his close friends and even business rivals. Justin Timberlake’s superficial and showy Napster Co-founder Sean Parker is still charismatic and fun, and the twins could easily have been painted as 1 dimensional silver-spoon snootie evil-doers. Instead, their empathy and doubts in their own legal and moral stance adds to the overall texture of this fascinating character study. It is for this reason we are glued to the screen, instead of throwing our hands up and exclaiming; “you all deserve each other” like most audiences to a civil legal dispute. The film looks fantastic. Like the original Twilight movie, the everyday student life is not sexed-up to look like a modern-day school-based drama TV show. Rather we are locked into the mid-noighties in Harvard. The film looks dark and has an ambience that could be described as thrilleresque, aiding the coldness and detachment the protagonist experiences. Apparently depth of field overuse is the new lens-flare, but this assists in the representation of Mark being kept at an arm’s length from his surroundings and the people around him. David Fincher has a very unique style of film and film-making. He is a genius of camera use (Panic Room’s sweeping camera through rooms and walls, giving audiences a visceral layout of the land), setting (Se7en’s atmosphere of an eroding city in moral decay), style (Fight Club’s neo-noir look: pumped up colours set in dark and grim surrounds) and themes (male relationships throughout his films, including Zodiac and heck! Even Alien 3!). They are all at play in this movie, albeit in an extremely underrated and restrained level. This may be a mark of a matured director, confident that he does not have to make such things front and centre, but having them in the background regardless, holding the movie together as a whole waiting to be appreciated by the observant movie-goer or to those willing to give it repeat viewings. The movie does subtley reflect on the past decade. In the wake of September 11, the public were treated to a swath of fantasy films (The Lord of the Rings, Harry Potter) or military propaganda movies (Black Hawk Down, Behind Enemy Lines). In the wake of the war against terror, which could strike anywhere at any-time, we retreated into our own lives with the use of the new iPod, whose marketing told us to play our own soundtracks to our lives. Little-by-little the public started to communicate again, albeit through the relatively ‘safe’ use of internet social networking sites, most notably Facebook, where one could have control over their chosen / perceived identities and over those who could view them. Of course, a whole generation was raised into this environment who took it as second nature: becoming ‘connected’ through electronic communication devices that intrinsically hold barriers. The movie deals with these themes of social isolation by weaving them through scenes showing social networking sites, legal proceedings and parties. It is quite sad to see that the founder of Facebook had to create the world’s biggest party just to get an invite. Apart from a visually jarring (but still enjoyable) rowing sequence, this movie is a great collaboration of film technique, script, acting and music. A work from a matured director who keeps on learning as he goes – 5 out of 5 friends. Check out the trailer, see what Margaret and David have to say and check out their interview with screenwriter Aaron Sorkin!